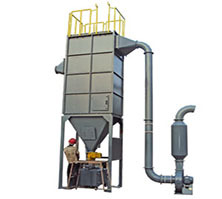 We are well known and renowned Industrial Dust Collector Manufacturers and Suppliers in India. Dust collectors are used in the industries for the collection of dust and that is equipped with the bag filters and aqua pits. Our range of Industrial Dust Collectors and Portable Dust Collector have heavy fabricated structure, eco-friendly in nature and also save the environment from the air pollution. Dust collection system comprises Industrial Dust Collectors, Cyclone Dust Collectors etc. Used to collect dust from different areas and takes it to a main dust collection area for filtration. At main area, the dust collector system uses advanced machines to separate different stages of filtration. Using cyclone, inertial, gravitational or centrifugal separators, it will separate out the biggest particles first and also small particles are collected with a media dust collector such as bag-house or cartridge. The final stage of filtration released before the air gets released into the environment. If you have any question about our products or want to know about Industrial Dust Collector Manufacturers, don't hesitate to contact our team by email essareng777@gmail.com or phone +91-98665 83700 and we would be always happy to assist you for more! !